Seed Oil SA was a proud first time participant and exhibitor at the SA Cheese Festival 2017 near Stellenbosch from 28 – 30 April. It was an absolute brilliant event with a wide range of different products to taste and buy. Cheese and wine tasting was at the order of the day. There were also a few quest appearances at the festival for cooking, cheese making, etc for the visitors to enjoy. One stand out was the cooking from Celebrity Chef, Nataniel, who loves cooking with Grape Seed Oil. 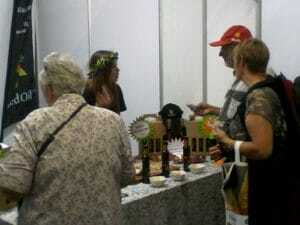 During his cooking he would mention cooking with Grape Seed Oil and after every show visitors to our stand increased. 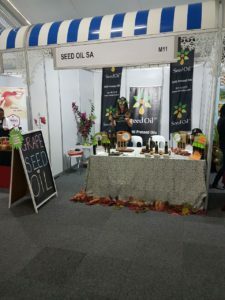 Seed oil SA had a very friendly and vibrant feel to our stand, M11. Friendly staff was manning the stand, educating the public on Grape Seed Cooking Oil and all its benefits. Our visible brand on the Grape Seed Oil together with our different flavours was very positively accepted by all visitors to the stand. Our grape Seed Oil story was well presented by Esté, Marketing and Sales Executive, who manned the stand throughout the Festival. In her own words “What a great experience and loved every minute of the festival”. Garlic, Rosemary and Chilli, before they buy or just to taste this lovely oil. Visitors had many choices of purchasing either 1 or two bottles, but there was a very nice gift pack available with three flavours inside. This was quite popular as it makes for a great gift to someone. Sales went very well and we are quite happy with the outcome of our performance at the festival. It was well worth the hard work that went into the three days at the festival. As a first time exhibitor at the SA Cheese Festival, we have done overall very well and will definitely be back at the 2018 Cheese Festival. Watch this space for the dates of our participation at the 2018 SA Cheese Festival.